Domingo Zubero was born in Dima in the Basque region of Spain on 11 May 1901. As a young child he was a playmate of Juan Luis Ellacuria, the future Father Aloysius. During an illness Domingo moved to Yurre where he stayed in the rectory of the pastor who was his uncle. This pastor baptized Juan Luis (Aloysius) on June 22, 1905. Domingo was 4 years older than Juan Luis, and his entrance into the religious life made an impression on him. 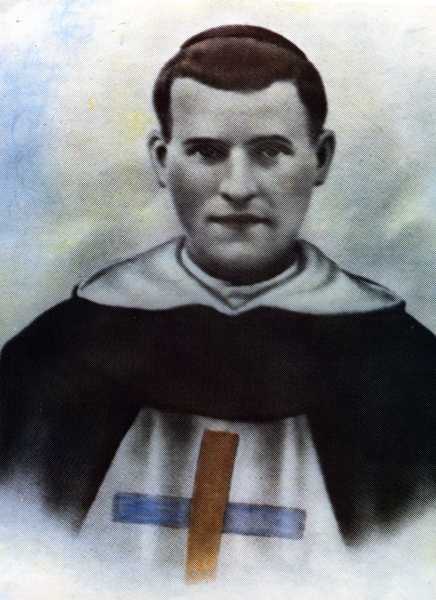 Domingo entered the Trinitarian Order and received the religious name of Domingo Iturrate of the Most Blessed Sacrament and was ordained to the priesthood. He celebrated Mass “as an act of personal sacrifice in union with the Supreme Victim on behalf of all”. His own life was soon to become a sacrifice also. As his health worsened he wrote “Our obedience to God’s will must be total, without reserve, and constant.” He died at the age of 26 on 8 April 1927 in Belmonte, Spain. Domingo Iturrate was beatified by Pope John Paul II on 30 October 1983. The boyhood home of Blessed Domingo Iturrate Zubero in Dima is being renovated and made into a museum by family members of the Saint. I believe I met the nephew of Blessed Domingo, who is a priest. He suggested we do the same for Fr. Aloysius. That is, renovate the boyhood home, and turn it into a museum.